Salmon is my No. 1 favorite fish in the ocean, and I am not alone. The rich and sometimes slightly sweet flavor, the velvety texture, the appealing color, and the fact that it takes so well to all kinds of preparations and seasonings make it a go-to fish for many of us. 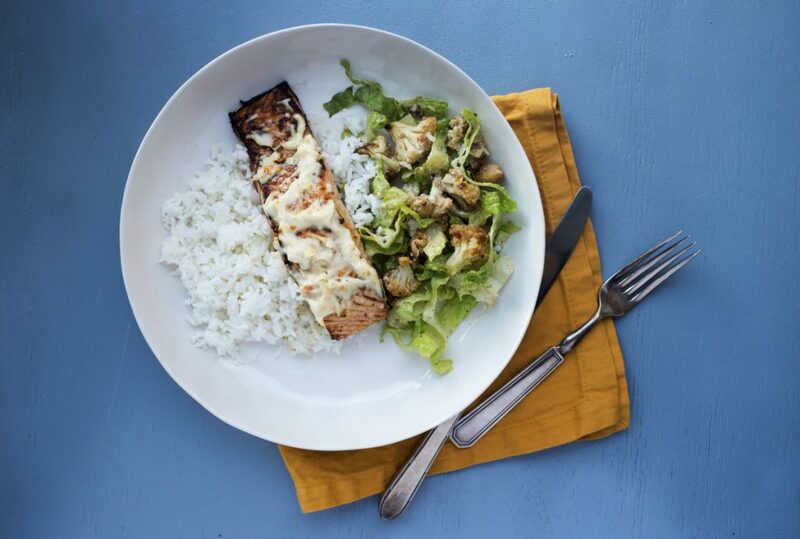 The bright flavors of lemon and orange are a nice complement to salmon’s richness, and they appear in both the marinade and the citrusy sauce that accompanies the fish in this recipe. It couldn’t be simpler, and if you don’t have the time to marinate the fish, it will still be delicious, although the flavors won’t penetrate so deeply. You can choose skinless fillets or use pieces of fish with the skin still on. In the latter case, place the fillets skin side down on the oiled baking sheet when you cook them under the broiler. When you remove the cooked fish to a plate, slide a spatula between the fish and the skin to separate it, leaving the skin on the baking sheet. If you love a crisp piece of skin with your fish, you might place the fish skin side up when you broil it. Watch carefully to make sure the skin doesn’t brown too much as the fish cooks, and if it starts to get too dark before the fish is cooked to your liking, change the oven from broil to 450 degrees F for the last few minutes of cooking. Zest and juice both the lemon and the orange. Mix together the two zests, then remove 1 teaspoon of the combined zest and set aside. In a small bowl, whisk together the olive oil and the citrus juices with the remaining zest. Season the marinade with salt and pepper. Place the salmon fillets in a baking pan and pour the marinade over the fish, turning to coat evenly. Marinate in the refrigerator for 1 hour. Meanwhile, combine the mayonnaise and the reserved teaspoon of zest, and season with salt and pepper. Set aside. Preheat the broiler. Transfer the salmon to an oiled, rimmed baking sheet, separating the pieces. Discard the marinade. Broil the salmon for 8 to 10 minutes until it is just cooked through and remove from the oven (the fish will continue to cook a bit after it is removed from the oven, so take it out just before it’s done to your liking). Transfer to individual plates, and top each piece with a spoonful of the sauce.